Ask a Hoosier.com was founded in May of 2009 by Terre Haute native Michael E Conner with the intention of becoming a forum to observe and discuss happenings across the globe from a distinct Hoosier perspective. That is, to seek out and promote original thought, provocative and intellectual commentary and lively discussion of all facets of the human condition from the unique points of view of Hoosiers. Now we are inviting high school, college and university students from across Indiana to become contributing authors and editors for regular publication in this unique and dynamic new forum. AAH is now expanding to what we believe is an exciting and vital new level of growth. At present Ask a Hoosier.com exists in the form of a blog, hosted by WordPress.com, but we have begun the process of converting to a stand-alone website that will eventually be supported by advertising revenues and product sales. Contributing authors are invited to submit for publication articles and essays under any and all categories. Likewise, those wishing to serve in an editorial role are enthusiastically invited as well. Editors will be involved in the critical and qualitative preparation of submissions for publication. So why is AAH doing this? As AAH has evolved we have realized there is great potential in involving Indiana student writers: AAH can offer them the unique opportunity to be published and read by many while yet students – and not just locally and not even just state-wide, but on a national and even international level. Such is the reach and power of the Internet. This expansion of AAH is also an opportunity to give back to Indiana in a unique and creative way, to open a door to students’ ground-level development of their writing careers – and simply for those who are interested in writing for writing’s sake – to practice their passion or offer their views. AAH is now planning a key phase in this – hopefully beginning Spring of 2012 – to reach out to – communicate with – high schools and colleges across the Hoosier state to discuss the details. Participation with AAH can also be considered either key or supplemental for certain academic assignments through coursework in English, journalism, public affairs, and creative writing as well as other disciplines such as high school yearbook staff or college and university intra- and inter-campus publications. And… a consideration that must not be underestimated: the importance that every graduating student – whether from high school, technical college, or university – ought to have a superior-quality resume in hand. The ability to demonstrate on their first resume that they are already published can be of immense value and the advantage cannot be over stated. We invite you to look over Ask a Hoosier.com, especially the Home and About pages. As you do, you will find the “Contributing Writers and Editors” page. As with the other sections, this one is evolving. New and increasing information will be posted here to address the program as it develops and in greater detail. Eventually it will serve to announce the AAH “staff” – those who participate. It will be dynamic – an always-growing, always-changing list – as people come, grow and go. We should make it clear: not every article or essay will be accepted; not every contributor will be published; not every edit will be approved. All final decisions regarding publications are reserved by the Publisher. This new phase in the development of AAH will become another way for students, budding professionals, hopefuls, dreamers, experimenters and others to build their portfolios and hone their skills, and maybe just to have their say – all by getting published at Ask a Hoosier.com. Even as Ask a Hoosier is growing and evolving we are striving to become a high quality publication with the highest journalistic and creative integrity and seek to be known as a superior endeavor of the highest reputation. We think this a great way to get there. We are excited about the “Contributing Writers and Editors” program at Ask a Hoosier.com and invite those interested to contact us. We look forward to hearing from you. Please inquire or submit to us at askahoosier@att.net. This essay was originally published in 2009. 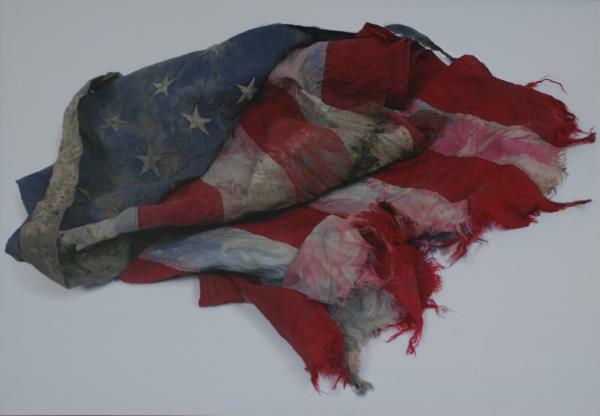 The flag was recovered from the World Trade Center site and photographed by Rob Hans. The term “9/11”, or in complete script form, “nine-eleven” has caused me heartburn since the horrific act of war in 2001. My complaint is simple, but at the same time, I wonder if it is a fairly unique, if not rather isolated perspective. I may be in the minority, maybe the extreme minority. I wonder. Here it is: I don’t like the sound of it. We have in a sense given the terrorist act an official name. My feeling over this heinous act remains as it does for most people: Anger. But like the act itself, I absolutely reject this term as anything I am willing to “receive” or “own”, in a philosophical sense. I feel a gut urge to distance myself from any sense of receiving or ownership, per se. In my mind, saying “9/11” does that. It is casual, it is easy to say, it is comfortable, it is informal, it is relaxed. Well, I don’t want to relax. I don’t ever want this memory – or the reference to it – to be easy. I don’t like it, and so I don’t say it. – – – Michael Conner is a Watch Officer with the Missile Defense Agency in Colorado Springs, Colorado and on the side a budding children’s book author. He also has a novel for grown-ups in the works. He is a retired US Air Force Intelligence Analyst and Space and Missile Operations Officer. Culminating a career of 23 years as a reservist, he most recently served as a Crew Commander with Headquarters, Air Force Space Command at Peterson AFB in Colorado Springs. He has worked in the aviation industry as a civilian, and holds a Masters Degree in Public Administration from the University of Colorado at Denver. He is originally from Terre Haute Indiana and is a graduate of Indiana State University. Now that my son is in fourth grade, I have been recalling memories of my own fourth grade year, and my teacher. Miss Harrison – Ann Harrison – was my fourth grade teacher. A belch, on-purpose or not; or a fart, of course – she wouldn’t even let that go, as embarrassing as it was. If it was audible, well, you’d get direct eye contact for sure, and why not? She’d call it out – and you: “That was rude, crude and uninhibited.” If it wasn’t you – that time – then the other kid deserved it, of course, after all, and you were just glad it wasn’t you. But if it was wafting evidence only, without a clear owner – what fourth graders still call an SBD (no need to spell it out, I’m sure) – the whole class would get the short speech, just to remind us in general, that we were to respect ourselves and others, and that was out of line. Actually, a belch on-purpose got it worse, because it was so blatant, so bold – so rude, crude, and uninhibited. First, you got called out with the line. Then you might be sent to the coat closet in the back of the classroom, to stand there and think about what you had just done: a long interior hallway running the full width of the room, open at each end, so you couldn’t just go and hide easily in there. The kids on the ends in the last row of desks could turn their heads and look at you – and stare – and with exaggeration, mouth words like, “stupid” or “you’re in trouble” or “rEtard” at you, all of which you in your young fourth-grade mind and heart already knew and felt like. The coat closet was a kind of place of refuge too, though. Not everybody could see you, and Miss Harrison never followed you in there to quietly, verbally thrash you into understanding. She just let you stay there for a while and simmer in the sickening anticipation of coming out. It was usually full of coats hanging on hooks, and other stuff like boxes and some shelves. At least you could sort of hide, at least your face, among the coats in your miserable and embarrassed silence as long as you were allowed to. The only problem with the closet in this case was that eventually, you had to come out, and that did make it worse. The only thing to do then was to go back to your seat as fast as you could while the hot feelings of shame burned all over again as the 36 eyeballs of all your now-former friends burned holes in your shirt with their glaring eyeballs, just glad it wasn’t them… this time. The alternative to all this was to be sent out to the hall, but it was reserved for no-kidding serious behavior felonies. This was definitely bad, because Miss Harrison always came out and you got the talking to. The coat closet could be seen as a first-timer’s warning. The hallway was real punishment with lasting consequences. She was in your face; her stern, serious but steady voice calmly explaining that your options were now reduced to a paddle here, or a paddle in the principal’s office, a call to your parents, or perhaps just as bad, while you’re standing there against the wall, not even knowing which way to face or look, dying a thousand deaths just at the idea that someone might walk by, one of the fifth grade or sixth grade jerks, bullies you hated. Or the girl you were crazy about might walk by and discover you in your obvious humiliation. They’d both use the same words, but very differently. The Jerk’s would be, “Wuuhht haaAAppened?” A slow drawn-out bell-curve slice of scorn. Your you-wish girlfriend’s version would be a truly sympathetic and heartfelt, “What hAppened? !” with a strong and quick “aa!” in the “…hAp…”-part to confirm her sincerity. Either way the response had to be pretty much the same, too. A pitiful and dumb “uh, nuthin.” Which got you nowhere, except still waiting for the next hand to be dealt. You could say she was strict. Even lesser unapproved school-social infractions, like being too loud in the hall, or whispering in class. If you’d do something that – admit it – ought to get you in trouble, or at least be challenged once anyway. Like maybe even picking your nose while sitting at your desk, or daydreaming or doodling right there in front of God and everybody. To hear my name out loud – paired with those words – was horrifying. A Boom. A sharp Ka-Pow! like a bolt of lightning; like a bombing going off. Then came the heat in your cheeks and ears. The burning from everyone’s eyes on you. You feel your own eyeballs, and as you stare down at your desk, your head is swimming in a swirl of embarrassment. Your eyeballs are going to explode right then and there and your humiliation will be complete. Miss Harrison didn’t do it, you did it yourself. She taught us that we were not to embarrass or humiliate ourselves. We were to respect and honor ourselves and others and to recognize and understand the boundaries of civility. We are not islands, we are not alone. Behave and be kind. Simple. You can conjure a pretty accurate, though incomplete picture in your mind. Yes, to a fourth-grader she was old and wrinkled. She had salt-and-pepper hair, short. Very thin and to a fourth grader, really tall and sort of drawn, as if she had really been a lot shorter but God took hold of her on each end and just stretched for a few minutes. And she was what people, many years ago called an “old maid”, having never been married. In fact, she lived with her mother. I always imagined they must have looked pretty much alike. In fact, we all knew that she was cool, like she knew what was going on, like the cool old lady down the street you could go talk to, ask an illegal question and get a real answer. A good one. Not like your parents. She could have been your neighborhood secret weapon of real-life knowledge. She was clued-in and cool about things – not like our parents. She was always calm and deliberate, as if whatever happened, she had planned for it and had the relevant wisdom all lined up ready to impart at just the right moment. She could not be fooled or surprised. After all, she had by this time, taught nearly four decades. She had definitely been-there-done-that. There was nothing new under the sun for her. I think it was the way she talked, and the way she talked to us. Her phraseology and so on. But it was also her awareness. She could see right through you and read your mind. She was also fair and even-keeled, and would listen to us deeply. Anyone taught by her knew they were understood. Because of this and many other things, we liked her very much. In fact, we loved her. I loved her. I know that now. We never would have – nor could have – said it then, but I think we all know now that’s what it was. And still is. All this really only describes a particular facet of Miss Harrison, and I have done so a bit tongue-in-cheek. But there is another significant memory of Miss Harrison. The last 30 minutes of each school day she would sit on a stool at the front of our classroom and read to us – a book from the collection of Laura Ingalls-Wilder stories, Little House on the Prairie. You spend a whole day at school, and although you get to go out for recess a few times along the way, and by the end of the day, say, by three-o’clock, you’re ready to get out of there. All kids in fourth grade have a certain minimum level of hyper-spazmocity that develops at twice the rate of puberty on-set. This is a well known and documented fact. But for us, in Miss Harrison’s class, those last thirty minutes of our day with her were the best, and we were in no hurry to go anywhere. In September of 1970 she began with Little House in the Big Woods. She read to us every day, as far as I remember. Somehow, even considering all the titles in that series (at that time, eight in all; others were published later), my memory fast-forwards to late spring of 1971. Too quickly, our year with Miss Harrison had come to an end. For that last month, May, she read to us the final book, These Happy Golden Years. And in my memory, I see her sitting there elevated above us on her stool, serenely and quietly reading and bright sunlight has filled the room, that golden afternoon glowing warm through the tall windows looking west. Todd, Vicky, Henry, Jeff, Randi, Benny, Roxanne, Karen and many others: do you remember Miss Harrison and her classroom at all as I do? Do you remember the reading time? I wonder now, how important, really, was it to me at the time? I guess I don’t know. But it’s very important to me now. My nostalgia has clouded my memory, I’m sure; enhanced it. But what I do know is that I am thankful for Miss Harrison and her reading. I am thankful for all she taught me. The truth is, even now, I can still be rude, crude, and uninhibited, sometimes, too often. Just ask my wife. She probably won’t admit it out of loyalty and kindness, but I can confess it’s true. But Miss Harrison’s efforts were not wasted. They were wonderful and good. She and what she taught me have become constant reference points for me, even after all these years. And at the risk of being uninhibited, I love you. It is indisputable that Major League Baseball commissioner Bud Selig’s [non]decision to leave Umpire Jim Joyce’s bad call on June 2nd’s game between the Detroit and Cleveland does not accurately reflect the truth. But it may accurately reflect history. And Life. My father-in-law was a very tough and successful business leader. And when it comes to the sacred game of baseball, he treats it with the same seriousness and intensity he did his career. When he and I discussed the following subject in June, it quickly became clear he would not do what I have even contemplated here. I have waited three months now to cool my mind off on this subject, to see if perhaps I might have changed my mind. I have, sort of – but with less conviction than I ought to have. 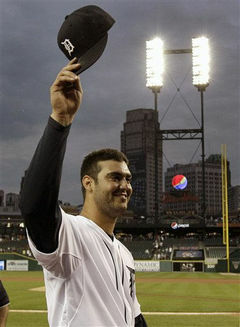 Wednesday, June 2, 2010, Comerica Park, Detroit. As the last play of the game unfolded, things moved fast. 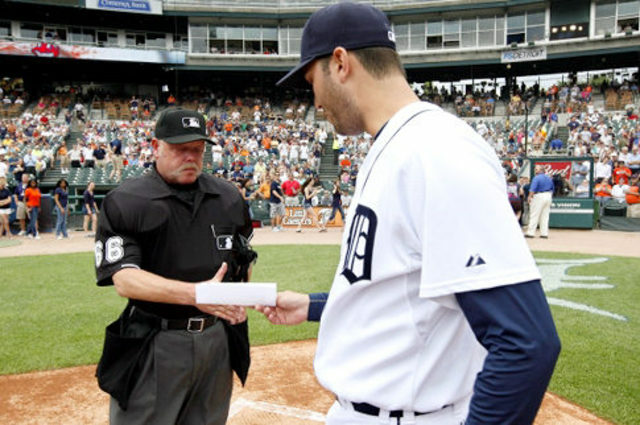 Tigers’ pitcher Armando Galarraga raced for First base and as he touched the bag took a short in-field throw from his second baseman. He beat Cleveland’s hitter, Jason Donald, but Joyce called him safe. Perhaps things happened too fast for Joyce to clearly see it, or perhaps the close proximity of the two opposing players reaching First almost together combined with might have seemed to be a lack of ball control on Galarraga’s part (this was not debated long if at all, and the video evidence shows Galarraga had no problem with the catch), his view-angle, or as some have speculated, he was not entirely alert, or whatever it might have been; so that in that brief instant when all possible factors came together, he made an inaccurate call: the runner was declared safe, and Galarraga’s history-making perfect game – what would have been the 20th in all of professional baseball – fell out of the record book before it even had glue on it. All questionable issues were resolved after the game, except whether or not the call would be reversed. Clear cut, right? So what’s the problem? Only about a hundred years of history and one floodgate. Apparently such rulings are not only not taken lightly; they’re not taken at all. So, therein lies the problem. Is justice to be done to Galarraga’s game, in fact his career, or is justice to be done to precedent, the history and traditions of baseball and posterity? The truth is this game may be (and probably will be) remembered at least as one of the most memorable and frustrating moments in all of baseball. But it will be remembered. The truth is also that this is a more complicated problem than what first meets the eye, and Baseball has wrestled with it many times before. While this instance may be the first regarding an on-field call, it is not new. It certainly resolves to be an imperfect solution, leaving the human mistake element in place as an integral and honored – even sacred? – part of our National Pastime. Perhaps the allowance of this imperfect element is what makes baseball a more perfect game. I am still undecided. 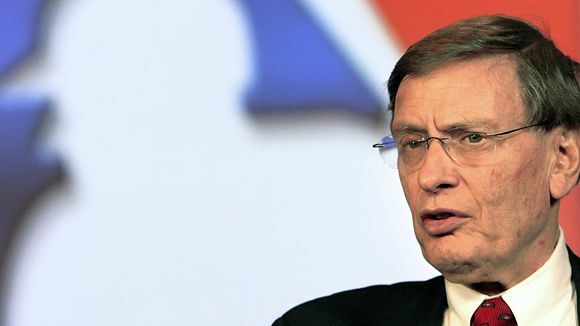 If Mr. Selig were to reverse the call would all of baseball history be thwarted and cheapened? Would our Sacred Game be lessened? Would the floodgate of compromise be opened to allow the destruction of the highest principles of baseball? Perhaps this level of strict rule and precedence and adherence to tradition would be better exercised when considering those who purposefully disgrace the game by cheating and lying. In stark contrast, Armando Galarraga and Jim Joyce both demonstrated the noblest of virtues in their athletic contest: they were good sports. They played the game well, with competence. They played fairly and honestly, and with class. Mr. Selig has what seems to amount to the power of life and death in his hands. In this case, I’d be pretty happy to see him grant life. What a story of triumph of the good and just, the celebration of what is right and deserved, and the just reward for the deserving. Maybe just this once? (…And it’s not as though it would not be justified.) And to acknowledge the facts and give them their proper place in history. Amongst the other professional and quasi-professional things I do, including pontification-writing, I like to play baseball, and played as a kid growing up in west-central Indiana. During our regular non-game hitting and catching sessions at “Conaty’s Field” in my neighborhood, I would often frustrate my friends in the outfield by pointing to the side of the field opposite of where the defenders were anxiously planning to catch my high fly-ball, then toss the ball in the air and hit it to the spot I had pointed to, making them run like the dickens across the field to get it. (Did they not believe me?) Back and forth, left field, right field, I jerked them, until my turn was up. One of my favorite baseball exploits. The effect of this moderate talent was enhanced when I would exercise my self-taught ability to switch hit. I would, without warning jump to the right side of Home Plate, and after switching the ball to my right hand and tossing it into the air, I would swing left-handed and hit a pretty decent ball. As it turned out, I only played organized baseball – Little League – for part of one season because my folks pulled me out after too many games at which some adults at the games screamed and cussed long and hard and without reservation. It was abruptly determined we would not be a part of that. That was effectively the end of my “real” baseball career with the exception of playing softball in the YMCA league a couple of years. I did not play organized hardball again until high school. In the intervening years, however, I nursed and grew my romantic longings for the game by playing pick-up games with friends and by subscribing to Baseball Digest. The focal point of my reading that periodical was the Baseball Rules Corner, where my knowledge of the more technical aspects of the game would be challenged. It was here that I learned the word and meaning of balk, still one of the strangest words I know. When I finally decided to play on the high school team as a sophomore, I had a rude and somewhat embarrassing eye opener: I had never hit – or even swung at – a ball going that fast. I had a tough time of it. As it turned out, our season ended just as abruptly as my Little League career. The wheels had already been turning for quite some time to close my school. It was a laboratory school, part of Indiana State University. Its name was in fact The Laboratory School, or “State High”, referring specifically to the secondary side. We were the State High Young Sycamores (trees one day, Indians the next; no one was ever quite sure. It depended largely on whom you asked. Adding to the schizophrenia, State High and ISU utilized both as mascots and logos). But in a world of public schools, it had become a dinosaur. This school was in fact a combined primary and secondary school, and up until then, true to its original purpose, provided actual classrooms for education students at the university; in its earliest days named Indiana State Teacher’s College. One of the unintended consequences of this winding down was the demise of most of the organized activities during that last spring semester of life of the school. This included, it seemed, last vestiges of “umph” that remained in anyone’s motivation to initiate and follow through on anything, and least of all a poorly coached, slovenly uniformed, little experienced team. Long before, the school baseball uniforms had gone away with nostalgic graduating seniors who knew what was coming and other such collectors. As a result, we received a donation of oversized, wool uniforms from the actual Sycamores of ISU. 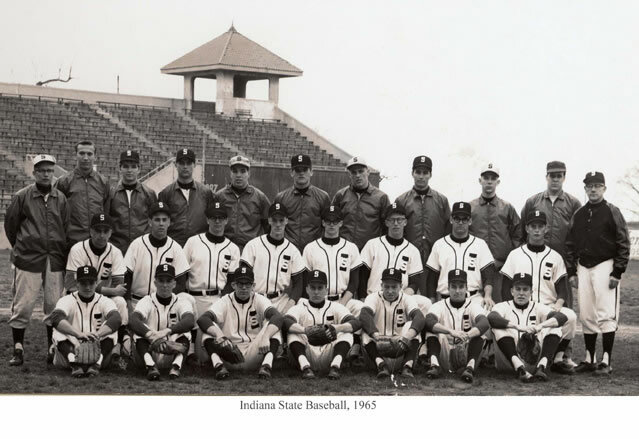 The uniforms were, according to the archival photos lining the walls of the college’s main athletic department building, from the 1965-69 seasons. Better than nothing, but they were huge – baggy, obviously old and noticeably worn. They made a pretty poor first impression. So, with about five lost games under our belts, the team, the season, and the school folded in one sad clump. In retrospect, I wish I still had mine. As a matter of fact, we were given our uniforms to keep as the school was closing. (I too, was told I could have mine, and I took it – just to see it lost to some unknown place in time, space, and distance, including that transition from high school to college, when life changes so rapidly it’s a wonder you live through it let alone come out on the other side as a sort of adult with all the clothes you started with.) It became a sort of free-for-all with regard to certain things; objects that could easily be claimed and hauled away. Old school logo t-shirts, gym trunks, and sweatshirts were also handed out or simply claimed as they were found. Why not? It was all suddenly being relegated to the dustbin and trash heap of history anyway. Our last game – and my last real, formal baseball game in a uniform, was played at Shakamak High School on a cool, sunny day in late May of 1978. An odd and anti-climactic end to an almost-experience. We got beat pretty badly, and we felt very down, not just about that, but about the whole thing. It seemed pretty miserable to lose not only the game, but our school. The Lakers were magnanimous and friendly about the whole thing. So, we went home, and that was it. Now these many years later, I have a father-in-law whose favorite sport is baseball. As a result, we occasionally end up in conversations about the game. He is far more current and frankly more interested in the details of any given season of MLB, including the statistics of players and team standings, but I have been pleasantly surprised I can hang with him even as long as I do. It goes especially well when we get in to the nostalgic and philosophical aspects of baseball. But much more significantly, I am once again playing – casually – with my nine-year-old son. Usually just the two of us, we’ll go out into our front yard, and he’ll hit balls for an hour. He isn’t yet much interested in catching, something he’ll have to get over soon. But he’s a good hitter, and that’s fun. I get quite a workout going after his line drives. Once in a while we go up to the neighborhood diamond before school and hit balls – what a great way to start our day….and…it’s one of the most sure-fire ways to make my wife ooze sentimentality for the next three days. In light of this aspect of my life now, I see more clearly that this is what is lasting beyond more temporal things: It’s not really baseball. It’s what happens between us when we play the game together. While Galarraga just might have had taken away from him his one and only “perfect game” in life, there is more to life than a perfect game. There’s more to life than any one bad call. And so we see that we’re not really talking so much about baseball anymore. And that’s what makes this imperfect life “perfect”.